Both a home décor piece and a flameless way to spread fragrance throughout, this stunning frosted pink glass fragrance diffuser is decorated with a gold accent, made to thoughtfully grace any room it’s displayed in. 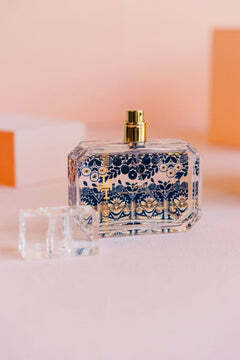 Millefleur serves as a gentle reminder of Springtime, with nuances of jasmine, hyacinth, lily of the valley, orange blossom and raspberry. This product is delivered via a 3rd party shipping provider. Standard shipping methods are UPS Ground or USPS Priority Mail. Rates are calculated at checkout and depend on size of product and location.